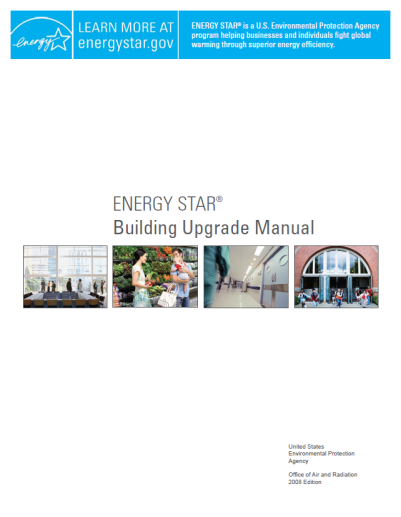 The ENERGY STAR Building Upgrade Manual is a practical guide that helps you plan and achieve profitable improvements to your building. Maximize financial and energy savings by following the five upgrade stages listed below. Be sure to follow these critical steps to achieve the maximum benefit. Identify underperforming equipment, determine which equipment should be replaced, and review operational tips to improve building performance. Improve your lighting systems to reduce lighting energy use, improve the visual environment, and affect the sizing of HVAC and electrical systems. Improve heating, cooling, and electric loads in your building to reduce the size and cost of equipment upgrades. Upgrade or adjust your fan systems to maximize energy efficiency. After implementing the steps above, you may be ready to upgrade to a new, properly sized system, or to retrofit your existing system to optimize operation, reduce noise, and reduce the amount of required maintenance. In addition to the steps above, you can learn about benchmarking, investment analysis, financing, and unique facilities such as K-12 schools. Not into reading all 250+ pages? Download just the chapters you need below.